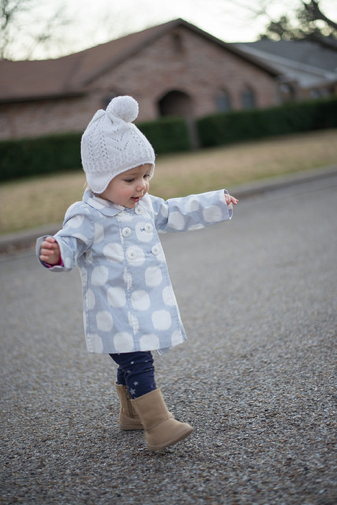 Walking is a monumental milestone in your child’s life. Mentioned in our gross motor development article, children 9-11 months old are able to scoot, pivot, crawl, and/or pull to stand. Once your child can pull to stand on his or her own, walking is the next step. Most children take their first step around 12 months. Here are some strategies to incorporate while encouraging your child to take their first steps. - Go Barefoot. Walking on different surfaces promotes natural weight bearing and shifting that is crucial for good balance. Allow your child to explore all different types of floors: wood, carpet, mats, sand, and grass. Walking barefoot helps children grip onto the surface better. Shoes may also be a distraction for some children, especially if they are bright colored or light up. - Incorporate games. If your child is actively engaged in a game, they will not notice your attempts to help them walk. Chasing games can encourage your child to crawl faster. Crawling strengthens leg muscles and improves control of movement. Once your child can independently stand, play the chasing game around the coffee table. Your child will be able to hold onto the table for assistance. - Relocate toys. Place your child’s favorite toys on higher surfaces. Do not move it to a place your child will never be able to reach but enough for a challenge. For example, place toys on a chair, couch, or side table. Place the toys near other furniture fixtures that can assist your child. Be sure to baby proof all surrounding furniture. - Objects in hands. If your child is ready to balance on their own but is hesitant, placing toys in both hands will help. When they are holding onto toys, they will be less focused on finding support systems. Musical instruments, stuffed animals, and blocks are some examples. - Play with Bubbles. Bubbles are a great activity for babies. Hold the bubbles above your child so they need to reach. Once the bubbles move towards the ground, your child will need to adjust from the reaching position to the squatting position. Moving from up to down will activate core muscles and lower muscles. - Push or pull toys. Push toys are a great tool for independent standing and walking. Most toys have a visual or audible reward while your child is pushing them, such as lights, bubbles, or music. Examples include shopping carts, toy cars, fake lawn mover, etc. - Assist your child’s walking. Initially, hold your child above the ribs to help stabilize them. Once he or she is independently stable, hold hips to activate core muscles. Holding your child’s hands while walking is a good way for them to feel comfortable with walking. Do not hold their hands every time or your child will use it as a crutch. If your child seems behind in the walking milestone, ask for help. Our physical therapists at Lumiere Children’s therapy can create an individualized plan to help your child reach his or her goals. "How to Encourage Babies to Walk." New Kids Center. N.p., n.d. Web. 25 June 2016. Talmud, Rebecca, Dr. "Walking 101: Teaching Children to Walk Independently!" DINOSAUR PHYSICAL THERAPY. N.p., 02 Feb. 2016. Web. 25 June 2016.